If we could show you an easy way to cut your IT support and maintenance costs by 27% to 43% while simultaneously eliminating recurring computer problems, downtime and the threat of data loss, would you be willing to read this so that we can show you how? We firmly believe that we can provide significant cost savings and other productivity-enhancing benefits to your organization that we are certain you’ll want to know about. Instantly cut your company’s IT support costs by 27% to as much as 43% while simultaneously improving the speed, performance and reliability of your computer systems. Dramatically reduce your risk of experiencing a very expensive, highly disruptive network outage, downtime or disaster. Give you complete peace of mind that your computer network is constantly being watched over, protecting you from viruses, hackers, data loss or other data-erasing disasters. Instant technical support so you don’t have to wait around to get help. Most tech support calls are answered live; the other small percent get a call back within 1 hr. or less. Plus, our technicians will be able to support and troubleshoot most network problems right from our offices – the INSTANT you call - so you no longer have to wait around with your computer down for a tech to show up! Receive ALL of the benefits of an in-house IT department WITHOUT all of the costs. As a PRONETS customer, you’ll have access to a highly experienced team of IT professionals, at your beck and call whenever you need them. Sleep easier knowing the “gremlins at the gate” are being watched. Cyber criminals never sleep! But thanks to our monitoring and ongoing maintenance, you’ll have one less thing to worry about. While it may seem like we’re making radical statements, we want you to know that we’re not “radical people.” As a matter of fact, one glance at our website at www.pronetsinc.com and you will see that we are a grounded and conservative-minded technology company with a long track record of helping our clients enjoy more stress-free productivity, lowered costs, and competitive advantages. 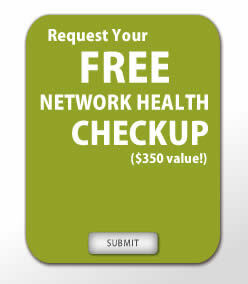 Call us today for a FREE Network Health Checkup at 888-544-7544, Extension 1006 or request your checkup online at www.pronetsinc.com – there is a quick form on the top left corner of the home page. We can’t wait to hear from you!